เสียงร้องนกแก้วคาคาโป ถ้าระดับเสียงต่ำไม่ได้ยิน ลองฟังจากไฟล์เสียงอื่น (รายละเอียดไฟล์) ที่เพิ่มระดับเสียงขึ้น 50%. 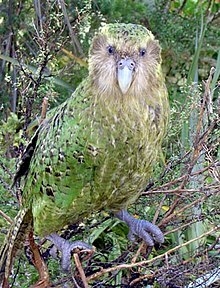 Image of pet Kakapo with expedition in 1888. ↑ BirdLife International 2008. Strigops habroptila. In: IUCN 2008. 2008 IUCN Red List of Threatened Species. <www.iucnredlist.org>. Downloaded on 27 December 2008. ↑ Wright, T. F.; Schirtzinger, E. E.; Matsumoto, T.; Eberhard, J. R.; Graves, G. R.; Sanchez, J. J.; Capelli, S.; Muller, H.; Scharpegge, J.; Chambers, G. K.; Fleischer, R. C. (2008). "A Multilocus Molecular Phylogeny of the Parrots (Psittaciformes): Support for a Gondwanan Origin during the Cretaceous". Mol Biol Evol. 25 (10): 2141–2156. doi:10.1093/molbev/msn160. PMC 2727385. PMID 18653733. ↑ Grant-Mackie, E. J.; Grant-Mackie, J. A.; Boon, W. M.; Chambers, G. K. (2003). "Evolution of New Zealand Parrots". NZ Science Teacher. 103. ↑ de Kloet, R. S.; de Kloet, S. R. (2005). "The evolution of the spindlin gene in birds: Sequence analysis of an intron of the spindlin W and Z gene reveals four major divisions of the Psittaciformes". Molecular Phylogenetics and Evolution. 36 (3): 706–721. doi:10.1016/j.ympev.2005.03.013. PMID 16099384. หน้านี้แก้ไขล่าสุดเมื่อวันที่ 15 กันยายน 2561 เวลา 20:32 น.